The December labor report was strong across the board. Specifically, construction added 38,000 jobs, retail trade added 24,000. Trade & transportation added 34,000, and professional & business added 43,000 jobs. Average hourly earnings growth was 0.4% month over month which beat estimates for 0.3% and last month’s reading of 0.2%. Average hourly earnings growth was 3.15% year over year as you can see from the chart below. This beat estimates for 3% growth and last month’s reading of 3.13%. As you can see, without rounding, the increase is only 2 basis points. The recent high was 3.17% in October. That was the highest growth this cycle. As always, I will review the length of the work week to see if the hourly wage growth translated to more take-home pay. The average work week was 34.5 hours which met the consensus and was above last month’s 34.4 hours. This all translates to average weekly earnings growth of 3.15% which is much higher than the 2.83% growth in November, but below the 3.47% growth in October. Wage Growth - October’s growth was the fastest of this cycle. 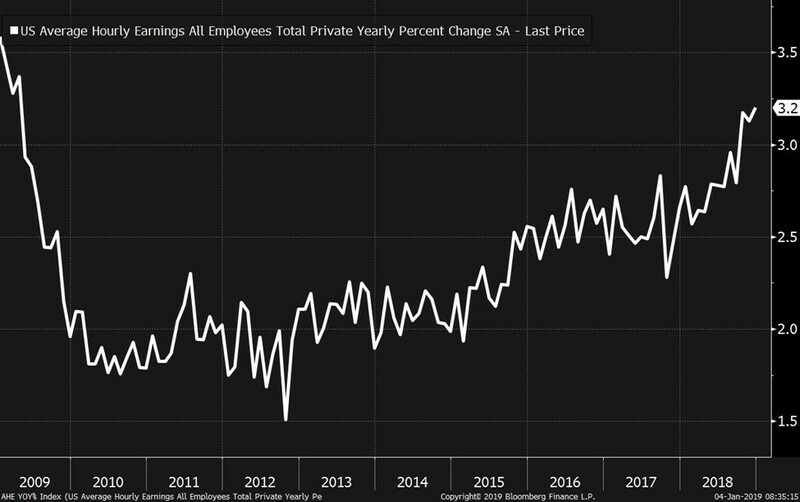 Earnings growth should be making new cycle highs because the labor market is tighter than at any point since the recession. Wage growth hasn’t met previous cycle peaks. There are still prime age workers without jobs that normally have them at the end of the cycle. Even though I’ve shown a lot of positive metrics from this report, the best one is shown below. As you can see, the average hourly wage growth for production and non-supervisory workers is 3.3% which is the highest this cycle. This is the highest growth since April 2009. The previous cycle high was December 2006 at 4.2%. Growth rate is still 0.9% away from the previous peak and that peak occurred one year before the last recession. This is another labor market indicator which suggests a recession is over one year away.